A quarter length bed rail for home beds, easily installs between mattress and box spring. HealthCraft Products Assista-Rail provides secure in-bed support, perfect for anyone requiring assistance to move and lift themselves out of bed. The Assista Rail slides between the boxspring and mattress, and secures in place with a safety strap. 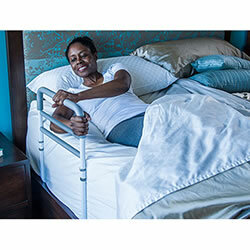 The Assista Rail is height adjustable to accommodate various mattress thicknesses. Multiple cross bars provide safe handle placements for in bed movements. The Assista-Rail also features a convenient bed organizer that keeps your belongings in reach, right beside you. Fits between box spring and mattress; secures to angle iron bed frame with safety strap. Note: VERTICAL LOAD BEARING ONLY - DO NOT use if you require more than minimal sideward (lateral) support. Maximum user weight 300lbs. Do not use with electric or hospital style beds. Supplied strap must be installed, tightened and regularly inspected for secure operation. Lock casters on mobile beds prior to using rail.